This chart is a simpler version of the Self-Help Hand Chart. The page actually gives you four small charts, so you will always have one handy. Put one on the fridge, near your favorite easy chair, next to your bed and tuck one in your wallet. Or share the extra charts with your friends and clients. Once you have printed the page (be sure it is set to print at 100%), fold the page into quarters, then cut along the fold. After completing your purchase, you’ll promptly receive a link to download the e-chart. If you don’t see it, check your SPAM and Junk mail folders. Be sure to download to a device that you can then print from. For best results, print the e-chart on a color inkjet printer. Small Hand Chart X4 © copyright 2014, Karen Searls. All rights reserved. 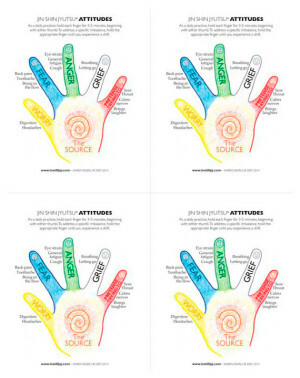 The Small Hand Chart X4 is for your personal use and does not come with distribution rights. No part of this chart may be reproduced, stored in a retrievable system, or transmitted in any form or by any means – electronically, mechanical, photocopying, recording, or otherwise – without written permission of the copyright holder.